Almost Wordless Wednesday ~ Wonderful Sunset! 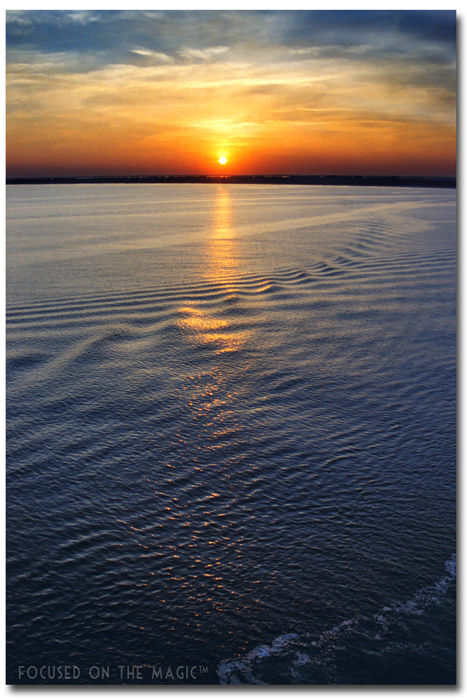 | Focused on the Magic : Almost Wordless Wednesday ~ Wonderful Sunset! Almost Wordless Wednesday ~ Wonderful Sunset! This was taken on The Wonder cruise. I've posted this picture before but I just felt the theme this week and this picture went well together. Water, water everywhere! The sunsets at sea are just amazing. Unlike most people, I enjoy late dining times so that we can sit out on the veranda and watch the sunset before heading off to dinner. Now it's time to see your Disney-style spin on the Water, Water Everywhere! theme. Here are a few suggestions to help you get started. A picture of pools, fountains, lakes in and around the parks. A picture of boat rides, water rides or water parks. People playing in the rain in the parks. A picture from a Disney cruise. I'm so excited to see all of your pictures! Please leave a comment below after you link up and tell me what you think of the theme. Love the picture and theme! I can't wait to do a Disney Cruise! Thanks Jenn! I always love it when you do your own theme! Thanks Leanne! Disney cruises are the best! Beautiful Pic, Deb. Nothing is more special than a Disney Cruise.. I need to get on another one soon...lol. Thanks Melissa! I could go for a nice relaxing Disney cruise too..it's freezing and windy out! Has Disney Cruise Lines called yet? This shot is enough to make me book a veranda cabin ASAP! Wonderful picture, and I love this theme! :) Thanks for hosting!